Here’s a great deal if you need a high-quality tactical, F-Class, benchrest, high power, silhouette, ELR, or hunting stock. Right now McMillan Fiberglass Stocks is discounting ALL its stocks 15% (fifteen percent). That’s right, EVERY McMillan rifle stock in inventory is on sale NOW for fifteen percent (15%) Off. But you must act quickly! This special 15% Off Sale concludes at 11:59 pm MST on December 29, 2018. So you have two more days to shop. Remember, this sale applies to ALL McMillan stocks, but the sale ends at 11:59 PM on 12/29/2018. Use Code STOCK2019 during check-out to save 15%. Note — Along with the 15% Savings, Free Shipping applies to orders over $50, standard ground delivery in the Continental USA. Shipping charges on previous orders will not be reimbursed. This offer cannot be combined with other promotions or offers. Offer expires December 29th at 11:59 pm MST. 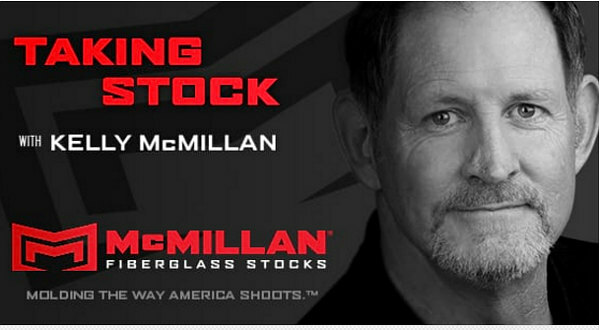 Share the post "Save 15% Now on All McMillan Fiberglass Stocks"
It’s great to see two important businessmen give back to the shooting sports. Kelly McMillan and Jim Borden are working together on a project — creating an F-Class Open rifle that can be loaned out to young shooters to help them get started with the sport. Great idea — we need to get more young folks involved in precision shooting. In F-Class (as well as benchrest) it seems we have an “aging population”. Engaging the next generation of shooters is vitally important. We’d like to see the looks on the faces of the juniors who’ll get to shoot this new rifle Kelly will be building. That’s like a Driver Training student getting to pilot a Ferrari. When this Editor got started in shooting, it was with very well-worn, hand-me-down 22 LRs at a local Boy Scout summer camp. We think it’s great that juniors will be able to sample something built with all-top-quality components. Every Friday at 11:00 am, Kelly McMillan hosts the Talking Stock Radio Show on the Voice America Network. This week’s show features guest Robbie Barrkman, founder of The Robar Companies and CTI (Coating Technologies Inc.). If you have used any firearm product coated in NP3, you have Robbie to thank for it. Kelly will also interview Extreme Long Range (ELR) shooter Randy Powell from Thunder Ammo & Arms in Oklahoma. Share the post "Kelly McMillan and Jim Borden Collaborate on F-Open Rifle"
Kelly McMillan hosts three top shooters on his Taking Stock Radio Show this Friday, March 31, 2017. The broadcast will feature ace shooters from three long-range disciplines: Dan Bramley (F-Open), Ian Klemm (F-TR), and Nancy Tompkins (Palma/Sling). Kelly says: “Friday’s show will be awesome. Shooters from F Open, F-TR and Palma/Sling competition will join us to talk about their specific disciplines.” During this week’s Radio Show these three top Long Range competitors will share their experiences and offer some winning tips for other competitive shooters. Ian Klemm (second from right) with Berger SWN-winning North-by-Southwest F-TR team. Share the post "Top Shooters on Kelly McMillan’s Radio Show"